Susan and I leave for Manchester, England today to visit Mathias and Laura-Jane and to watch them dance at The Lowry. We shall return on July 6. I will take pictures and hopefully post some beauties when I return. Susan leaves for Minnesota on June 12 for her quilting class at the Split Rock Arts Program at the University of Minnesota (on full scholarship!). She will be gone one week. This means the possibility of another room to be painted in her absence and considerable discounts on mirrors and framed work by Susan. I will make the decision after we return from England. In the meantime, I hope everyone enjoys the 4TH of July holiday. Over Memorial Day weekend, Susan and I recently went to one of our favorite cities, Washington DC, to a book auction in Falls Church. I also packed my bike and went bike riding on Friday on the wonderful bike trails in the area while Susan went to Arlington Cemetery and contracted poison something. I guess she put her hands on the wrong tombstone for a rubbing for her ongoing grave rubbing quilt series. Northern Virginia is the Mecca of bike trails. You can travel the whole length of the Chesapeake and Ohio Canal (145 miles! 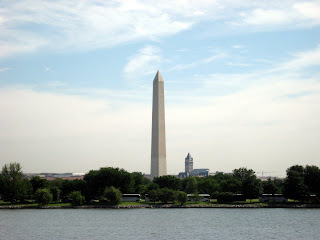 ), ride to Mount Vernon, transverse the 44 mile Washington and Old Dominion trail from Shirlington to Purcellville, bike into DC via Georgetown and up to Bethesda, MD, and so on. These trails are automobile-free, paved or hard gravel and are safe for just about any type of all-terrain bike. I try to stay on the paved trails as I have smaller racing tires on by bike (yea right, racing tires!). In the past I have usually stayed at a motel in Virginia that is near to the W & O trail and have attempted to ride all the way to Mount Vernon (about 22 miles or so one-way, depending on the location of the hotel). I have never made it all the way (real close one time- within 2 miles), but I will real soon. On this trip I rode from Dunn Loring down to the Custis Trail which leads to Rosslyn and the beginning of the Mount Vernon Trail. 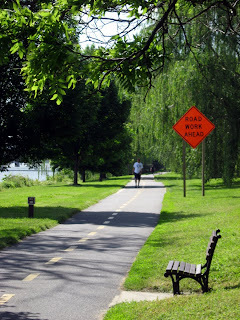 I took this trail through Old Town Alexandria (note that this area does use public roads for about 2 miles but I have found it very safe in the past), past the Wilson Memorial Bridge to a park near Belle Haven Marina and turned around. I then biked into Crystal City and wussed out and took the Metro back to Dunn Loring. The total biking distance was about 30 miles. Not bad for an old man but I've done better! Next month I planned on being in VA at another book auction when Susan is in Minnesota at the Split Rock Arts Program. My hotel is adjacent to the W & O Trail in Herndon and I am going to try to ride to Purcellville. Wish me luck! Below are a few pictures I took along the way. 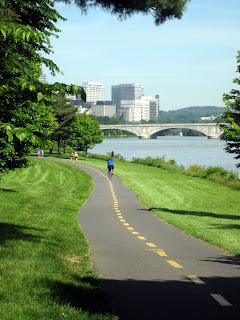 Please visit this website for a complete listing and links to the bike trails in the DC/VA/MD area. Downtown Richmond, VA, on the other hand, is not bike friendly. While Susan was visiting historic Hollywood Cemetery, I ventured down toward the James River to find the location of the old Virginia Boat Club or as I remembered it as a child of 5 and 6 (Ca 1960), The Boat Club. This private club was located on Mayo Island but was abandoned and eventually bulldozed or destroyed by the Floods caused by Hurricane Agnes in the early 1970's. This is where I learned to swim, fish for catfish, and play handball. I am not sure if my father was a member or whether General Motors Insurance Co. had a membership, but we spent a lot of time here. As I remember it was a pretty swanky place. According to some rudimentary research this was a real society club. He obviously was moving up in GM; they actually provide him our house in Richmond in 1957. I always believed "something" happened between my parents (actually I know something did happen and it wasn't good), his work situation, etc. that caused my dad to take a lateral move to Norfolk in 1961. I was too little to remember the details but I know my older brother was never the same after we moved. The bike ride was challenging as Richmond is very hilly and some of the roads lead to Interstates where bike are not allowed. The fabulous Richmond Canal Park forbids bikes on their trails so I had to ride on sidewalks and cobblestone streets to Shockhoe Bottoms to Hull Street (US 360) and cross over the bridge to Mayo Island. I parked and walked the former site of the Boat Club and the old baseball field. As a child I remembered seeing a railroad trestle from the pool. 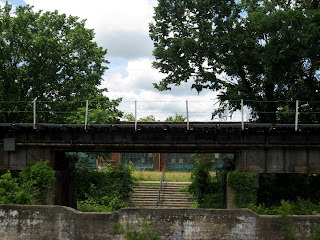 Today there is some building (vacant I think) on the original site and I roamed over to the train trestle and took some pictures. I later discovered on the Internet some old pictures of the site Ca 1956 which probably show the old Boat Club Ballroom. I have also learned that the Valentine Museum has over a million photographs of Richmond and they have other pictures of the Virginia Boat Club. One day I am going to return and do some more research on my life in Richmond. Richmond is a great city and one that Susan and I would like to live in if the right opportunity occurs. 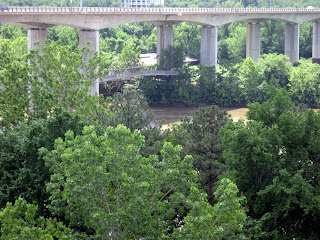 In the meantime here are some photographs that I took of the James River and Mayo Island. Susan and I may actually be back in Richmond this Friday (she needs to return to Hollywood Cemetery for more grave rubbings!). A photograph of the train trestle over Mayo Island. I found a really cool bent rail tie and cast iron washer for Susan (click to enlarge). 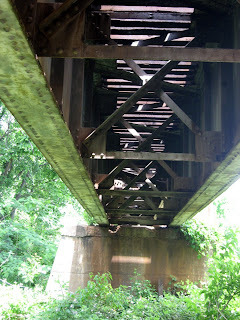 Another view of the railroad trestle. In the background is an abandoned building where I think the swimming pool of the Boat Club was located.